Before deciding to write this article on VoIP for law firms, we performed some detailed research to see if there was actually a need for us to add to wide selection of content on this subject that is already available on the Internet. What we found was that there is a lot of cookie cutter and vague information scattered around the web, and very little constructive information that is specifically geared towards helping law offices improve their phone services. So instead of rambling on about what VoIP is and what the benefits are, we have a detailed set of customized questions that are specifically geared towards law firms considering a VoIP solution. When you are done reading, please feel free to add a comment and let us know if this was useful to you, or if we completely missed something that you feel is important and relevant to law firms. What is your current monthly phone bill and what features does it include? This is critical to have in hand as you need this to compare with other services, and determine whether or not it is even worthwhile considering a change. Also take a look at how many outbound minutes your company is using every month as this can be a key factor in identifying the cheapest plans. Who is your phone service provider? Why does this matter? Well, if you are currently happy with everything except for your phone bill, it is worth calling to find out if there are any promotional rates available. Most phone service providers will negotiate to try to keep your business. Be sure to talk to a supervisor and find out what the very best deal is that they can offer. Make sure you have read through this article first though, and have figured out what the best alternative is, as it will help you with this negotiation. You also need to find out if you are in a current contract that has cancelation fees if you decide to stop the service. What type of phone service do you currently have? This might seem like a stupid question, but you might be surprised to find out that the majority of voice services that cable providers offer are actually using VoIP. So if you have some form of triple play bundle in your home office, you are already using VoIP, but likely being charged a lot for it. If your firm is located in a leased office, you need to know if there is a phone system (PBX) in your building that is used for connecting internal extensions to each other and routing calls to the outside world. The bottom line here is to make sure you clearly understand what equipment or service is handling your phone calls. Besides lower phone bills, what other features do you want? You have likely heard that VoIP service comes with an abundance of features that can help the productivity of most companies. Here are just a few that could be extremely useful for law firms. What the Feature is and why is it relevant to Law Firms? On Demand Call Recording Record any call at the touch of a button. Archive your phone calls and ensure you keep all the details of every call. Makes life much easier when trying to track details and build a case. Call Monitoring There are many reasons why you should have this capability available when needed. Enables the ability to listen in on other peoples calls in the office. Great for training purposes, feedback and many other uses. Call Tracking Easy access to call logs with details on which numbers have been called from which extensions and what the duration of the call was. A must have to back up dates and times of those client conversations. Mobility / Work from Anywhere / Cell Phone Integration Whether you are in your office, meeting a client or in the courtroom, this feature means that your cell phone becomes an extension of your office phone and it is as if you never left the office. Auto-attendant and Call Handling Especially important for smaller firms to immediately create a big company perception to both new and existing clients. The auto-attendant is a call handler that answers your incoming calls and offers a menu of options to help direct the caller to the correct person or department. For a detailed explanation of this feature, please visit our auto-attendant page. Voicemail to Email A great feature that simply allows you to receive every voicemail in your email. Extremely convenient as just takes a click on an attachment to listen to a voicemail. Ensures that you do not miss a message from an important client while you are stuck in a meeting. Ad-hoc and Meet-me Conferencing Easily connect multiple calls into a single conference while you are on a call. Meet-me conferencing allows you to schedule a conference call at some point in the future and allow your clients to use your personal dial-in invite. Hands free headsets If you are on the phone a lot, then these are a must have accessory to your IP phone. Many different wired and wireless (Bluetooth) options are available that work with most IP phones. For more information on these accessories, please visit our IP phone headsets page in our equipment section. Shared Call and Line Appearance Set your phone up so your administrative assistant can screen and answer your calls for you. Reduces your workload and filters out the calls that you don't really need to take. Online Fax Send and receive faxes from your computer. Saves smaller businesses the cost of purchasing a fax machine, while it saves everyone time by making it incredibly easy, quick and convenient to send or receive a fax. Also great for attorney's that need to ensure faxes are kept confidential. No more standing around the fax machine waiting for an important fax to arrive. It will arrive right in your in-box with an online fax service. For more info on this feature, visit our Online Fax section. Note: Please visit our provider features comparison tool for a full list of features and to compare provider options. How many phones lines do you currently have and do you expect to need more in the near future? This will determine what the best options are for phone service. If you choose a hosted VoIP solution, one of the great features of this service is that it is extremely easy to add, remove, or change lines. Do you have a phone system (PBX) located in your building? Find out if you need to use this for your call routing. Check the make and model and find out if the outbound calls are going to the PSTN. A SIP trunking solution can be used with an on-site PBX to re-direct these calls to a SIP service provider, and enable your company to avoid the hefty fees that the phone company charges. What this means is that your entire phone network effectively remains the same but you still get cheaper phone bills. What type of Internet connection does your company have? Find out what type of service this is (Cable, DSL, T1, T3, Fiber, etc), who the service provider is and what the upload and download speeds are. Find out if you share this Internet connection with other companies in your building and if there is a way to guarantee your bandwidth. Each active VoIP call can roughly consume between 30kbps and 87kbps depending on what codec is used, what the payload size is and if there is any packet loss. Although this is a small amount of bandwidth per call, it can add up as more and more concurrent calls are made. Make sure you clearly understand how much bandwidth you need for VoIP and how much you have available. The VoIP provider will be able to help you with this calculation. Is there an IT person responsible for your internal network? If there is, then good news, you can just ask them all these questions and basically tell them you want to reduce your telephony costs. This will be extra work for your IT person though so you may get some push back. If you choose a VoIP solution, you will need their help as the voice packets must be prioritized over other network traffic. A good IT person can easily configure the network for this through the use of QoS (Quality of Service). If there is no IT person available, then you can likely make decisions as needed. With no IT person, the phone service provider should provide setup and installation support where necessary to ensure that any new service is operating as efficiently as possible. How reliable is your Internet connection? If your Internet experiences regular issues or outages, you have bigger problems than just expensive phone bills. You need to get a 100% reliable Internet service as quickly as possible and then re-evaluate your phone service options. VoIP is not a good option if your Internet is not reliable. Is your network secure? VoIP technology encapsulates your voice call into a digital packet that is transmitted over the network. You should already have a very secure network to protect confidential client information so this should hopefully not be an issue. You do however want to be certain of this as you do not want someone hacking into your phone user portals and accessing information such as recorded phone calls and potentially inadvertently violating a client confidentiality agreement. We have created four different hypothetical law office scenarios which will help point you towards the best phone solution. These are based on company size and location (home, small building, large building, etc). Company A - Your law firm operates out of a home office or very small office. Typically company size is one to two people. Company B - You rent a few rooms in a small building or own the building. This company is in the five to twenty people range. Company C - You lease space in a large building, a larger firm with twenty to fifty employees. Company D - You lease space in multiple buildings, a large firm with many employees (more than fifty). Cost effective solution for larger companies with over 50 users. Google Voice Very cheap option that is good for start-ups and is primarily web based calling. Skype Similar to Google Voice and is a popular web based calling service. Rebtel Excellent solution that leverages low cost VoIP calling with your cell phone. American Bar Association information on VoIP - not a whole lot of information here but you might want to check it out anyway as it is the BAR's document. It does not appear to have been updated recently unfortunately. Have a Question or Comment that is not covered above? Ask Us! 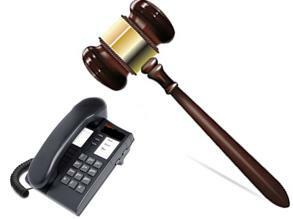 We are interested in hearing from anyone that has experience with Law firm phone services. We always believe VoIP is the best and cheapest solution, but let us know what worked best for your company.